For over 3 decades TMS Architects has been designing award winning residential and commercial projects throughout New England. Their mission is to embrace their client’s visions and translate them into buildings that are beautiful, functional and sensitive to the environment. This architectural firm is not only interested in the “frame” of the building but also the canvas fabric and paint used to bring it to life. 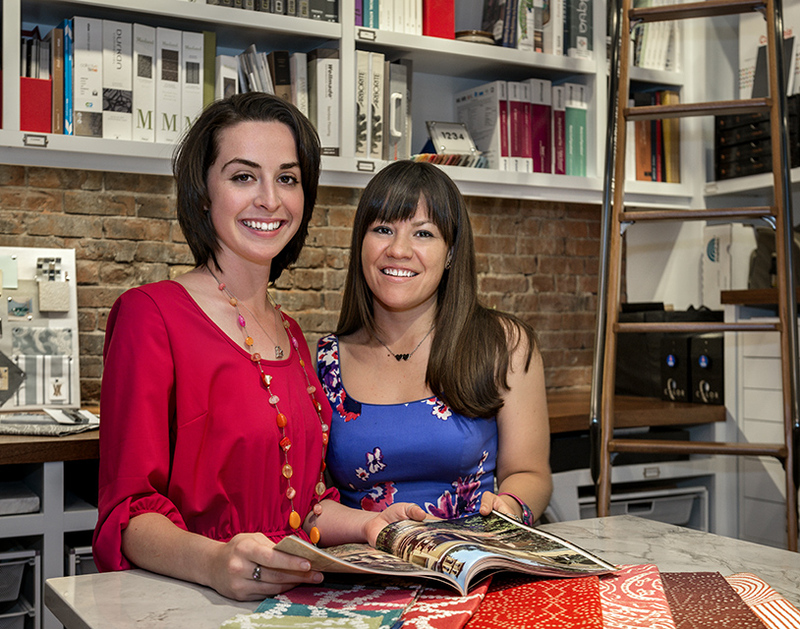 They have gone even further towards a holistic design vision, and recently added a new TMS Interior Design Studio. 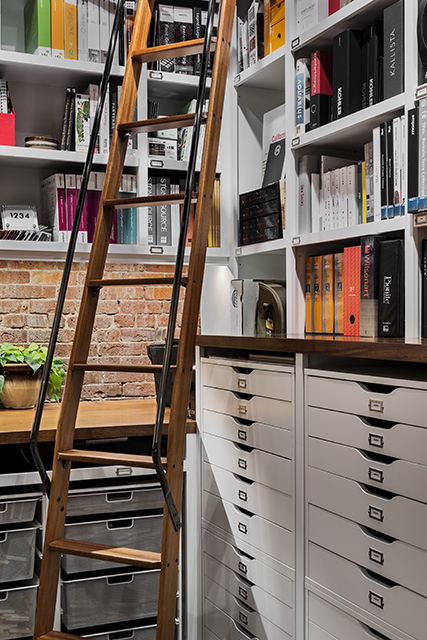 The goal of adding the Studio was to help clients hone in on not only the style and shape of the exterior but also the look and feel of the interior. Cristina Marais, Project Manager and Interior Designer for TMS works synergistically with the building and design process and helps her clients chose the interior in a carefully measured timeline. If the client had grand dreams of a dramatic free standing Japanese style soaking tub but waited until the interior designer was normally brought in, it would be much too late for the structure to be modified to support the weight. The earlier decisions like this are made the more easily they are wrapped into a seamless design. 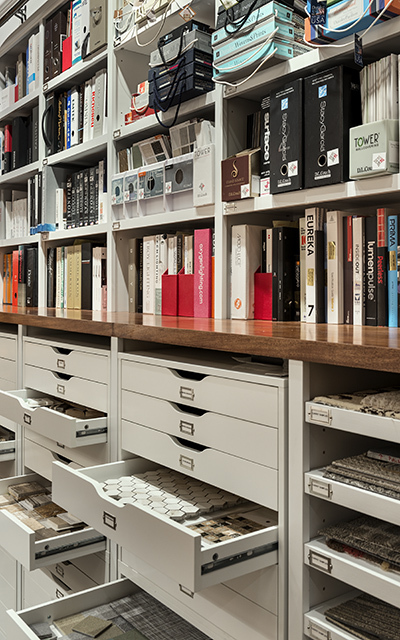 To further cater to clients, TMS decided to create an actual “studio” where they can browse through a curated collection of finish materials. The idea is to select from finishes that align with the timeless look of a TMS designed exterior. 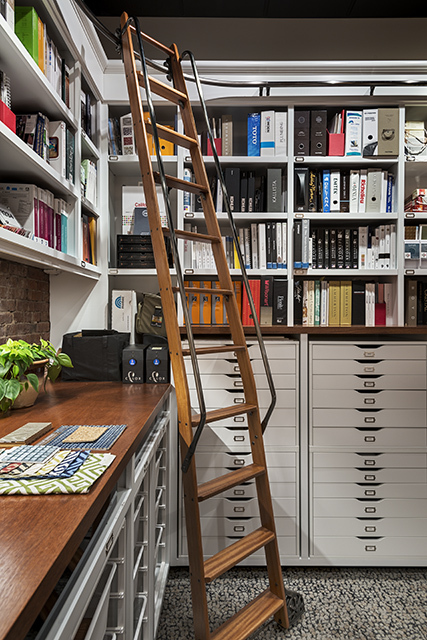 The studio took the space which had previously been a dimly lit private office. 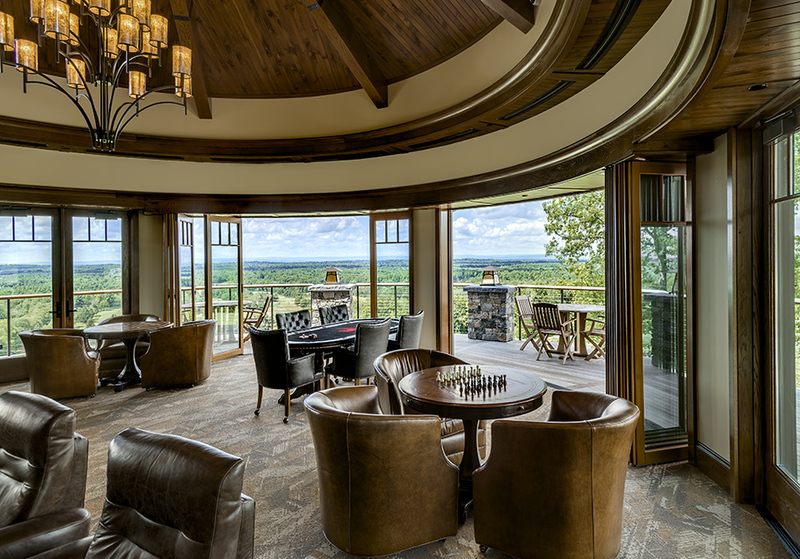 The room was carefully designed by architect Rob Carty, and built by Chris Ragusa from C.M. Ragusa Builders. Chris has worked on several of TMS’s projects and was familiar with crafting every last detail. 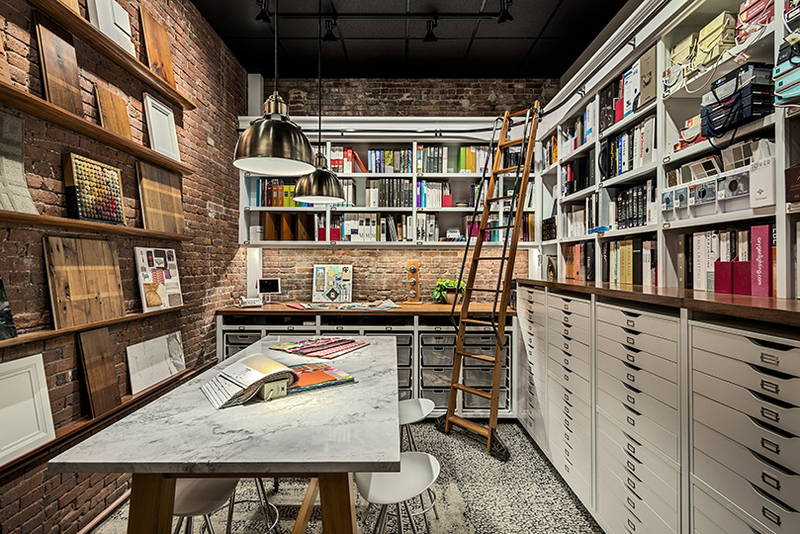 The Design Studio itself is quite lovely. The goal of the space was to get clients excited about the interior design, but also to not make them feel overwhelmed with the process. 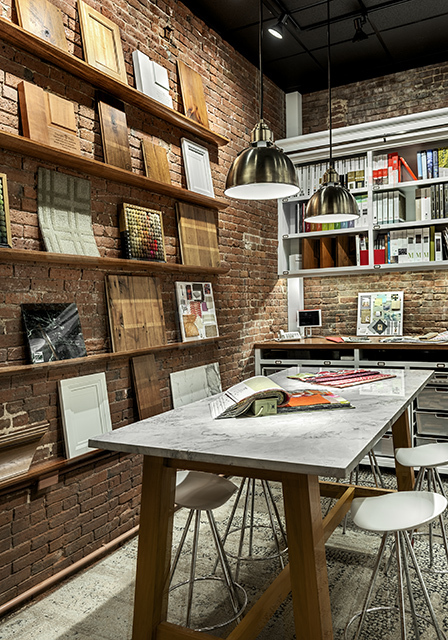 The modern space has exposed brick, high ceilings, and wireless color changing LED lights to simulate in real time how a color or texture might look in the home based on ambient light sources. 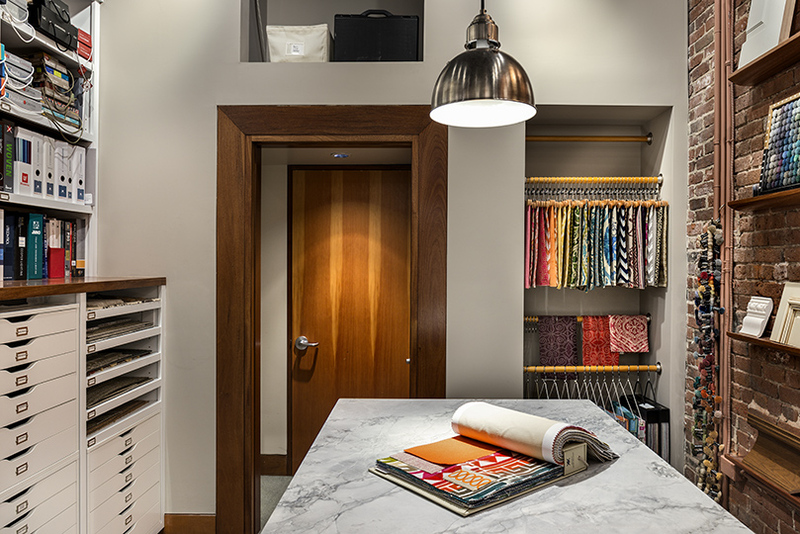 Clients can sit at a custom designed marble quartzite hightop table and “pour” over lighting, flooring, tile, fabric, hardware and paint swatches to suit their particular needs and taste. It is not only cost effective to use the same firm for both architecture and interior design, but the teams work synergistically with each other to also save time. Christina anticipates the client’s wishes well before they get to the finishing phase of a project. 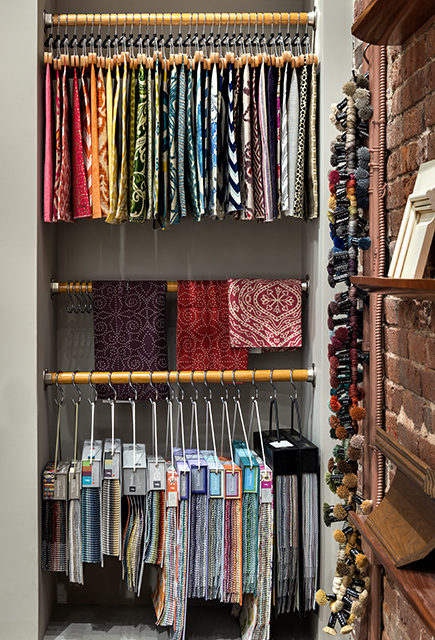 She helps them choose materials that will be practical and pleasing to the eye—while taking into account not only their taste, but also their lifestyle. While working alongside the architect, she helps clients choose materials based on what is next in the construction phase. It is not only the residential client who benefits from this “inhouse” service. 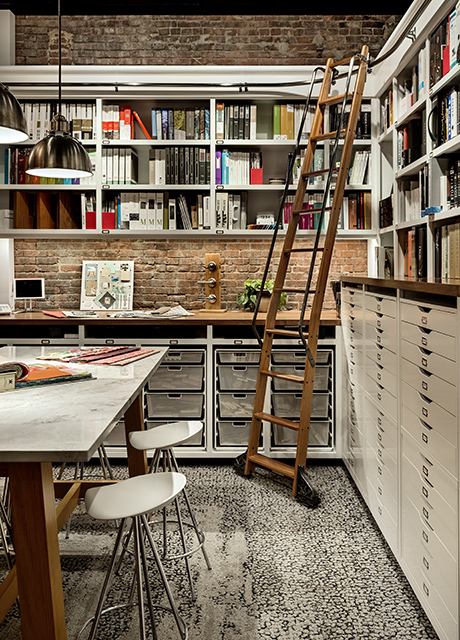 Commercial spaces are also important for creating a particular feel with functionality. 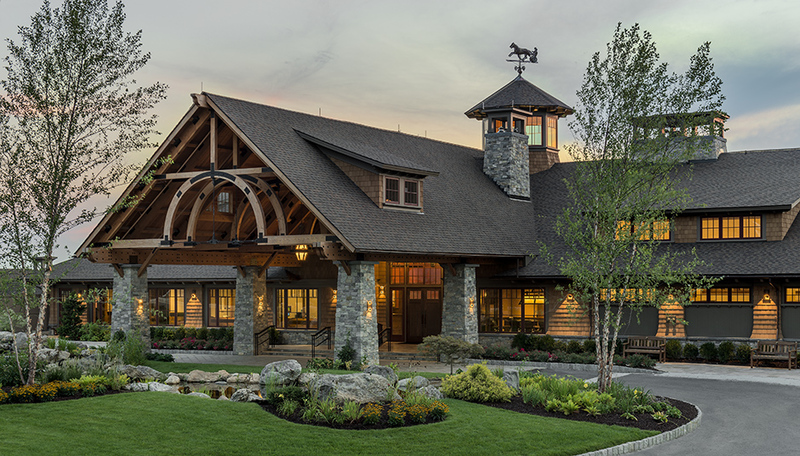 TMS has helped renovate and build several golf clubs in New England; most recently, the Greathorse lifestyle club in Hampden, Massachusetts. 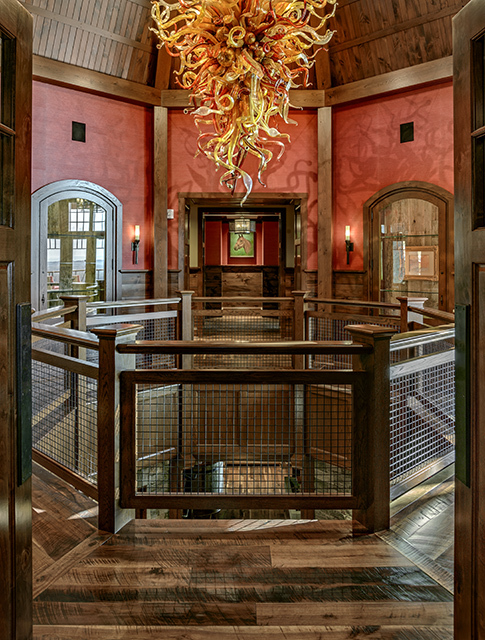 Both the exterior and interior of the main clubhouse was completely designed by the firm. 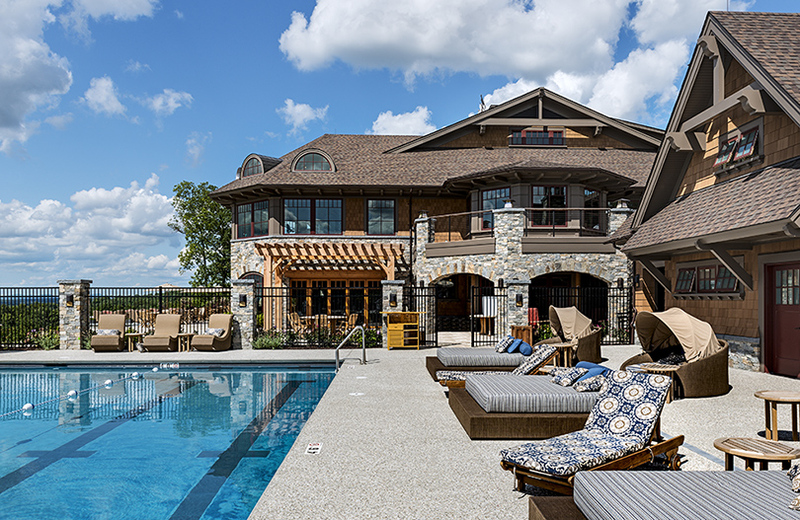 TMS was not only able to design the building and interior finishes, but also helped select outdoor furniture, accessories, draperies, signage and even silverware. 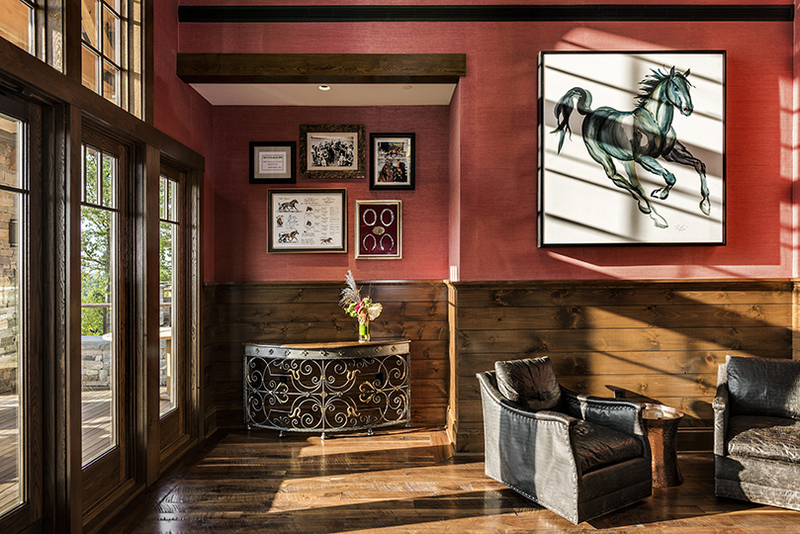 The owners of the club had given TMS the task of creating a high end look without feeling too formal. They wanted their members to feel like they could kick back and relax to embody a lifestyle. To learn more about TMS Architects please visit www.tmsarchitects.com and to learn more about CM Ragusa Builders please visit www.cmragusa.com. SPONSOR CONTENT	To the Sea, To the Sea….